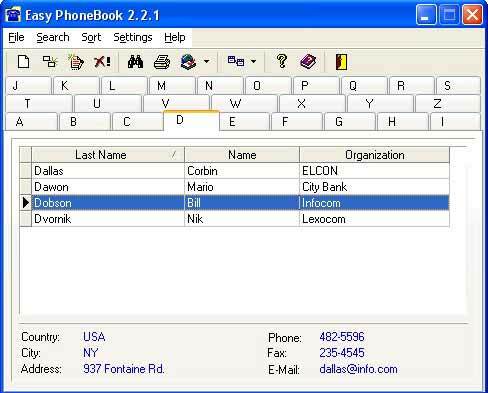 Easy Phonebook is a full-featured telephone numbers manager with intuitive interface. You may load as many contacts inside it as you want. Perfect for sales leads, customer database, vendor database, business and personal contacts, and much more. Unique feature: quick search from the main window of the program without opening the menu "Search". Allows to speed up the data search on the following parameters: last name, Name, Organization. Type the word to search. The text appears in the window title, next to the program icon. To delete the text click "Esc". If you like to change the search object, click on the title in the table of records. Intuitive and handy interface with customizing information panel. Records sorted by surname, name and organization in alphabetical order by means of tabs. Tabs language is independent on the interface language. Possibility to add tabs and interface languages. Operations with databases: possibility to use some databases; protection databases by password when changing them; backup and restore of the database; export and import database or some records.